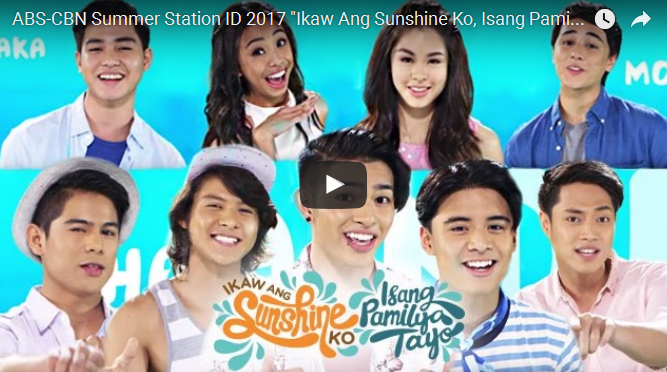 ABS-CBN has released the lyric video of their highly-anticipated Summer Station ID 2017 titled "Ikaw Ang Sunshine Ko, Isang Pamilya Tayo." The newest Kapamilya Summer Station ID was written by Robert Labayen, Love Rose de Leon, Johnny de los Santos and Tiny Corpuz with music by Thyro Alfaro and Yumi Lacsamana. It was performed by BoybandPH, PBB Lucky Teen Big 4 (Maymay, Kisses, Edward, Yong), Tawag Ng Tanghalan Top 3 (Noven, Sam and Froilan) and teen stars Sue Ramirez, Alexa Ilacad, Kristel Fulgar, Sharlene, Kira Balinger and Ylona Garcia.